Hopes of a second railway station for Rugby were given a boost this week when all parties supported a call to try and secure funding. 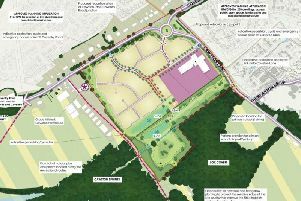 Cllr Maggie O’Rourke (Lab New Bilton & Overslade) proposed a motion at Warwickshire County Council’s full council meeting urging the leader to take action on plans for Rugby Parkway Station which would be sited on the new Houlton development to the east of Rugby. She called for him to make ‘urgent representations to the Department of Transport to secure national funding’ - a call that was backed by fellow councillors. And an amendment from deputy leader Cllr Peter Butlin was also supported. His amendment added that the council would ‘investigate all methods of financing Rugby Parkway Station and seek to align the building of this station with the housing delivery on the Houlton site’. Cllr O’Rourke said: “There are some really major concerns for lots of residents living in Rugby about the traffic movements and the air quality. And Cllr Butlin (Con Admirals & Cawston) added: “When you build 6,200 houses on the edge of a town it creates an awful lot of traffic and lots of those people are going to be commuters. “As part of the original development there was a proposal for a station but as the costs kept mounting up things fall by the wayside and one of those was the station. We are now looking at different ways of funding it.